The State of the Union Address and Republican Response – Doing What’s Right or Hollywood Hype? At least no one shouted, “You lie!” this time. Of course, the Republican senators and congressmen spent the majority of the time with stern countenances as President Obama relayed his vision. Speaker of the House John Boehner set the Republican tone earlier by calling the president’s speech “pathetic” so that was no surprise. What’s surprising is that neither party is willing to work with the other to better the conditions and circumstances of the everyday American citizen. Actually, it’s shameful. 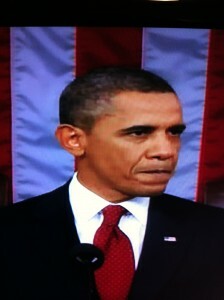 The president stated he does not want to return to the same policies that placed America in this recession. I argue no one – Democrat or Republican, Tea Party or Libertarian – wants that. Hopefully, they will prove it by stopping childish name-calling and finger-pointing and getting to the business of fixing this country. Note: I found it strange that as ABC went to a commercial break, it was announced that the State of the Union Address and Republican Response were being brought to us by The Descendants, which is a current theatrical release starring George Clooney. Well, ABC is owned by the Walt Disney Company. Which begs the question: Did I just view a big Hollywood production? Governor Mitch Daniels of Indiana delivered the Republican response. The response went pretty much as expected: The President is wrong. His polices are wrong. His ideals are wrong. Wrong, wrong, wrong. Republicans are right. The only way to cure what ails America is vote in a Republican president and Senate. He advised America’s problems are mathematical, but didn’t provide an actual formula or solution. To really get the viewer’s riled, we were enlightened to the fact that the Obama administration works to divide Americans by courting favor to certain groups. We were also enlightened that the current administration feels we are too incompetent to self-govern. Woo-Wee, them there’s fightin’ words! Hmmm, this may really be one great big Hollywood production, after all.